I was a teacher's pet in school. Like, big time. I was never a troublemaker (although I do recall getting in trouble for reading during math in fourth grade), and I pretty much did what I was supposed to do. Because I was terrified of getting in trouble. I think that stemmed from the time I got detention in first grade...which was a very traumatizing experience for poor little Erin, of course. So cute, right? Who would give that sweet little thing detention? ...I think that was her name. I honestly don't remember. It started with a B, in any case. That was 19 years ago; give me a break! Anyway. One day it was raining outside, so we had indoor recess. Mrs. B. told us that we could only play if we were finished with a project the class was doing. And then she left for some reason. To smoke some ciggies and rob a liquor store, I'm sure. So I started playing, which was super fun! And then I remembered that my project wasn't finished, so I stopped playing and started working on it like a good kid. When Mrs. B. came back, she asked if anyone played instead of working on their project. I, being a very honest child who NEVER lied (right, mom? ), told the teacher that I played. Because that was the truth! I did play for a couple minutes before I remembered to work on my project. Unfortunately, she didn't give me time to explain what happened, and immediately gave me detention. DETENTION!!! For me, the cutest first grader ever!! I was understandably upset. I cried a lot. And then I went to detention after school, where I had to sit in a dark room with a bunch of fifth grade street youths. I obviously didn't belong there...it was terrible. Detention was the worst, even though it only lasted five minutes (what was the point?). And I didn't even deserve to be there! I should obviously sue for emotional damage. Mrs. B. is darn lucky that I don't remember her name. And that I'm not particularly litigious. Another memory from first grade: I rolled up a strip of construction paper like it was Bubble Tape gum and ate it off the roll. And some kid in my class thought it was gross. What's so gross about eating construction paper? That's what I want to know! Remember to enter The Orchid Studio giveaway! Also remember to click the banner below to vote for my blog today! 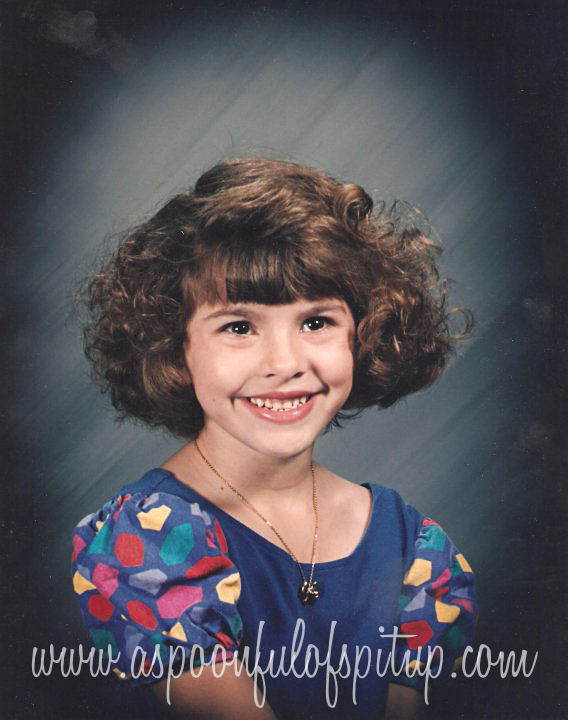 If enough people vote today, maybe I'll find some curlers and recreate my first grade photo!